They put it in print… aerial garage? Articles of the past century can bring up interesting changes in what words were used for various items, places, or events. An article on the Wright brothers from 1908 (The Omaha Daily Bee, Sept. 9, 1908) mentioned a curious term for what we commonly call a “hangar”, where airplanes are stored. 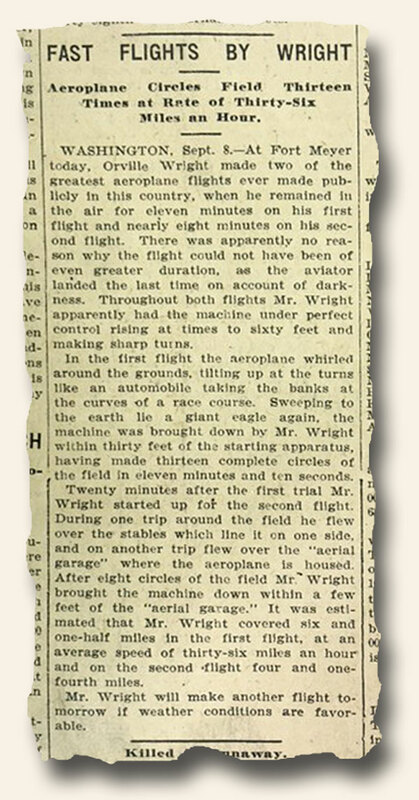 The article reads in part: “…and on another trip flew over the ‘aerial garage’ where the aeroplane is housed…”. The quotation marks for “aerial garage” were the writer’s addition, as if the person did not know what else to call it, or perhaps the term “hangar” had yet to be commonly used. But “aerial garage would seem to be a more logical term! Wonder why it never caught on? The photo below shows the full text of the article.